It was a bear photographing this look. The more detail my phone has to focus on the worse off it becomes. Poor little smartphone. It focuses in and out for seconds before it settles and most times it just stops on the blurriest sight. I cannot wait until I get my hands on a new camera! What ever happened to flakies? They had a serious moment a while back and have since been forgotten. I only own one or two and do not look forward to the day I run out of my favorite Nfu Oh. I gave into Gotham Polish’s recommendation and bought a 51 before the company discontinued the shade. I really should have bought two. I have not seen one that is identical to this one…and honestly not a whole lot are even similar; depending on the base color the flakies literally shine any color of the rainbow and it is fabulous! I hope you like today’s look. At first, I didn’t like the colors because the flakie leaned so red but after trying other combinations and disliking all of them this one grew on me. It is definitely interesting! your nails look great, I love this nail art! You’ve done such a great job! I like this manicure! Hi there.. My phone does the same thing. It has scratch markes on the lense. It can focus sometime but barely.. I got a camera.. But so annoying having a phone with “no” camera. I don’t even bother with my phone anymore. My phone camera is pretty good but gets tired so quickly…I used to use a Fujifilm but it broke so in the meanwhile I just use my phone. I know most independent companies released flakies collections in 2014/2015 but I never found one that was identical to this Nfu Oh…they all run along one color or another but there is something so special about this one since it can look like any color…I dunno I am super picky about flakies since I don’t usually go for them! Wow, i love the polish. My phone is also often a jerk when taking photos. Matte finishes are pretty much the only mani photos it doesn’t have a problem taking. I’ll take a look at those! I remember Dance Legend had some great ones! Hehe, my phone is the same way…it especially does not like HK Girl Glisten and Glow top coat! So pretty! 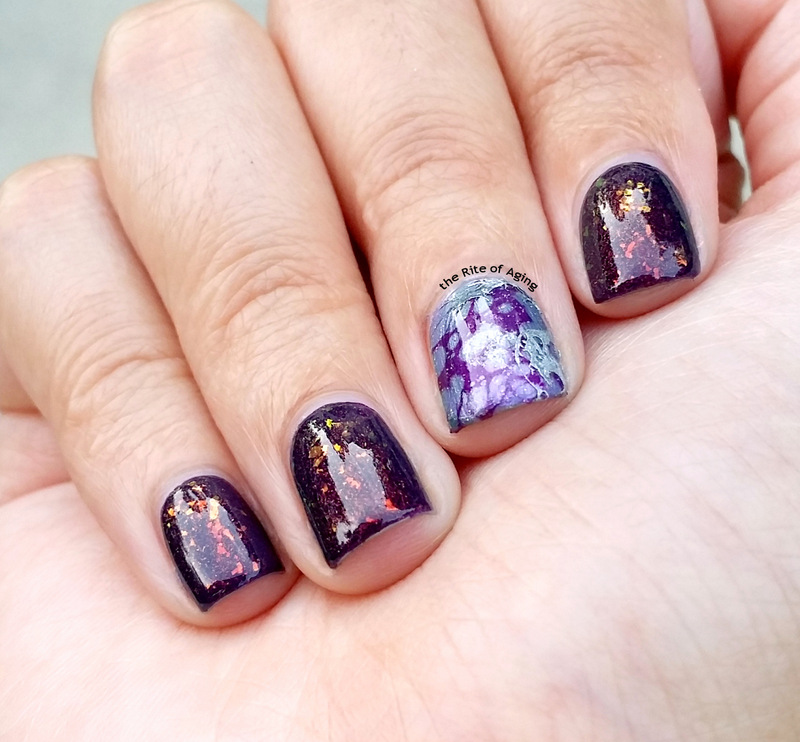 I dont have any of the old classic flakies but this manicure makes me totally wish I did! This flakies polish was actually my first impulse buy based on blog recommendations! Thanks! I am no fan of flakies to be honest, but the colour shift with Fall shades is to die for! !!! I am the exact same way, Simona!! There is something about how this polish picks up the base wonderfully that sets it apart from the other flakies! Yeah! I have a Samsung…I don’t know what I am going to do when it runs out…maybe cry..heh!